Phoenix Tower, Houston, Texas: This 38- story building received extensive damage from Hurricane Katrina requiring massive repair work. Kemco Inc. was responsible for glazing all the replaced glass and adding new gaskets. 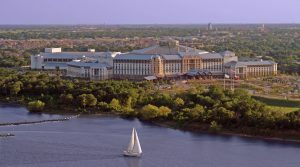 The Gaylord Texan, Grapevine, Texas: This 8-story Hotel and Convention Center was constructed by Balfour Beatty. 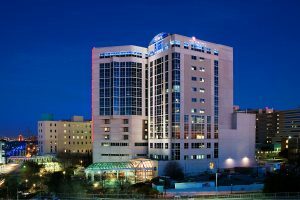 Kemco installed below grade waterproofing, deck coating, concrete floor sealers, and joint sealants and also provided the waterproofing membrane that holds the “river” that runs throughout the atrium of the hotel. Hamilton Park Baptist Church, Richardson, Texas: This historic Baptist Church was in need of repair work to the steeple of the church, which was leaking water into the interior of the building. The repair work performed by Kemco Inc. included Cast Stone Restoration, Masonry Restoration, Window Replacement, and Joint Sealants. Children’s Medical Center Tower III, Dallas, Texas: The CMC Tower III designed by FKPR is an 11-story addition to the existing hospital constructed by Balfour Beatty. Kemco Inc. was responsible for below grade waterproofing, deck coating, joint sealants at windows and precast, penetrating sealer at precast and the expansion joint system. Cotton Bowl Stadium, Dallas, Texas: This historic stadium required concrete floor coatings at the vomitories and bathrooms to be redone. Kemco Inc. Specialty Contractors removed existing coatings and installed new epoxy floor coatings at those areas. Immaculate Conception Catholic Church, Denton, Texas: The stucco and window caulk joints needed repair on the exterior of this church. Kemco Inc. Specialty Contractors cutout and re-caulked all window joints and stucco control joints and applied elastomeric acrylic wall coatings at all exterior walls. Other work performed was the installation of water repellant on block and stone masonry.